Round Glasses. Fashion changes all the time come spring, summer,autumn and winter. Trying to keep with trends can be difficult but if fashion is what you breathe then you will not have a problem grabbing the latest fashion trend which includes fabulous Round Glasses or SunGlasses. They have been featured on Catwalks, Blogs, Lookbook.nu and even on Retro/Vintage Goddesses walking the streets across the globe. 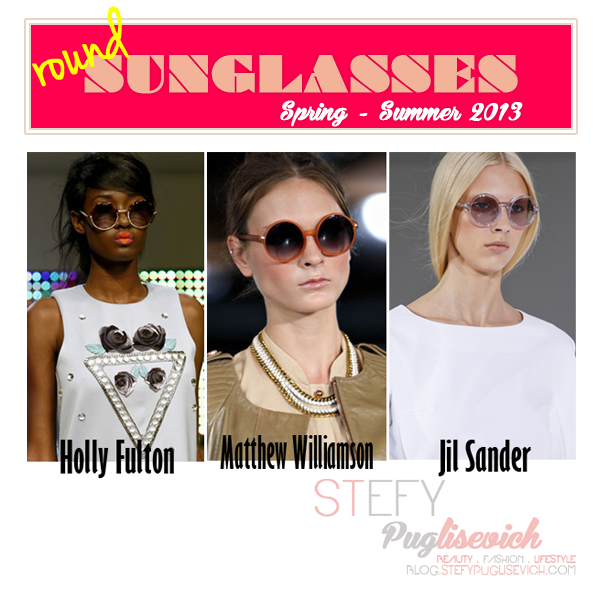 Spotted on the Runways were Rounded Sunglasses small, medium or large in prints, glued on pearls and in multiple colours. Some Shows include Matthew Williamson, Jil Sander, Holly Fulton, Acne, Mara Hoffman and others. With this being said, I have Round Sunglasses coming in Stock in my shop I AM EFFIE in Black and Gold with Gold Rim which I am looking forward to Photograph and see in hand. I am one that loves over-sized glasses so having Round over-sized retro sunglasses is different. What is your take on Round Sunglasses? Do you Like the new Trend? Have you seen the different styles, shapes and patterns? DO YOU LIKE THE CURRENT TRENDS?